I have tried almost every medication imaginable. Some of them helped temporarily but my pain and depression grew worse daily. I received regular epidural spinal cortisone injections every couple of mont…hs. That too offered temporary relief. I began using CTFO CBD Oils and had Unbelievable results. I no longer need a cane to walk. My constant pain throughout my body was gone. I even noticed that I didn’t have headaches from which I suffered every day since I was a teenager! This is my story. It’s long but my journey has been longer. It’s been in my drafts in progress for weeks. I have had fibromyalgia for over 26 years. I also suffered from depression, anxiety and migraines with aura for most of my life. And let’s not forget insomnia which came along about 10 years ago. For my migraines, I have taken almost every prescription medication available through the years including Fiorinal with Codeine, Imitrex, Zomig, Demerol, Inderal, Tylenol 3, Cafergot, Maxalt & Naproxen to name a few. Preventative meds caused nasty side effects so that wasn’t an option other than taking magnesium supplements. For my depression/anxiety, over the last 33 years, I have taken all of the following antidepressants. Changes to medications usually occurred due to side effects or being no longer effective: Prozac, Zoloft, Effexor, Cymbalta, Paxil, Celexa and Wellbutrin. The withdrawal symptoms were almost worse than being on the drugs. For my insomnia, I was prescribed Ativan, Ambien, Tramadol and Lorazepam, And finally, for my fibromyalgia symptoms, there was a correlation between the antidepressants and symptom relief however, for good measure, let’s add some more drugs. I was given Lyrica then Gabapentin and eventually Naproxen. I was on Naproxen coupled with Extra Strength Tylenol for years before discovering CBD oil. In 2011, I had a car accident…hit from behind..car totalled. This caused a tear in my rotator cuff and required open shoulder surgery in 2013. Then, a tumour was discovered on my T8 vertebrae. I had spinal surgery (a triple laminectomy of T7-T9) in November 2017….benign (thankfully)….6-12 month recovery. Still recovering. It was the WORST pain of my life….not exaggerating. Apparently, for those of us who have fibromyalgia, the pain is significantly worse as our nerve endings are always on “edge”. When I discovered CBD oil, I weaned off 4 medications out of 5 within 30 days. It was incredible! And then a couple of months before my spinal surgery, I noticed that I wasn’t getting the same relief. I needed to find a CBD oil with a higher potency & possibly better quality. Surgery caused a major setback. I was on Hydromorphone and then Tylenol 3 and back on Naproxen and Tylenol. I was also still on Wellbutrin. My doctor was supportive of me getting off these nasty drugs when I felt ready. I have now been taking the 1500 mg CBD oil for just over a month. I’m up to 10 drops 3 times a day. I still use the pain relief cream every night before bed. This is ALL I’m using for pain now. Mornings are bad. Wake up and the pain is an 8-9, Within 30 minutes, it drops to a 5-6 now after 10 drops. It’s manageable and allows me to do my physio and focus on recovery. I hadn’t had a migraine either until last week. I think it was weather related. I took an extra 10 drops once my aura started and I rubbed the pain relief cream on my temples and forehead. Within 30 minutes, the aura was gone and I was up about an hour after it had started with only a mild headache left. No nausea and no lethargy from the old Rx meds! My doctor can’t believe that 3 months after my surgery, I’m doing as well as I am. He hasn’t had to refill my prescriptions which was surprising to him. He was also pleased to see that I wasn’t depressed considering my pain level and the fact that I have been house bound until very recently. Soon, I will be starting the long journey of weaning off my last Rx medication. Due to the half life of the antidepressants, I am extremely grateful that I now have CBD oil to help me counteract the side effects. One of my biggest fears last year was being off work due to my chronic conditions and pending surgery. I sincerely believe that through the Law of Attraction and my daily meditation practice, that I was able to set things in motion that led me to these life changing products and this incredible opportunity. In a very short amount of time, I have created a business that allows me to earn more than I ever have in my corporate positions. I have an amazing team of people who motivate me every day to push myself. I get to work from home and no more sick days. They are all “me” days. I have finally found my passion and this is my story. I now get to share it knowing that I’m helping people change their lives too. I have degenerative disc disease, arthritis, stenosis, and bulging discs in my back. I’m in pain constantly and I’m in pain management. I took 5 drops of the 500 mg CBD and in 10 minutes all pain was gone. I haven’t been pain free in 20 years. What a wonderful feeling. Thank God for this product. Before using CBD products he never got this much improvement. CTFO CBD products are unbelievable!! “I was diagnosed with Musculoskeletal pain accompanied by fatigue, sleep, memory and mood issues and a systemic autoimmune disease that occurs when your body’s immune system attacks your own tissues and organs several years ago. I have been under a doctor’s care ever since. You cannot tell by looking at me that anything is wrong, and I have tried really hard to act like it wasn’t. But some days the pain was so bad it brought me down. For seventeen years I haven’t been able to sleep well and with Musculoskeletal pain accompanied by fatigue, sleep, memory and mood issues the sleep pattern plays a big part in the disease. It is like a vicious cycle, you can’t sleep because you hurt so bad and you hurt so bad you can’t sleep. The lack of sleep exacerbates the problem. A simple hug from someone hurts me. I have even had tears come to my eyes when someone hugged me. My flesh hurts. If you touch my upper arm or back or legs it hurts. If you have never experienced this then I am glad for you but it is real, not imagined, as once thought. I have often told my family, if you could put me under a scan and it would show my pain you would be so shocked at how much pain that I have been in. My doctor told me that my nerve endings were frazzled much like a rope can become frazzled or frayed and they react like open nerve endings. The cold is a killer. It sets off the pain and I simply cannot stay in it. For a year now, I have been reading about CBD oil and keep saying that I was going to try it, but kept delaying it. Finally, at a friend’s insistence, I got it and have tried it for one week and one day. I am happy to report that this stuff really works. My pain is decreased by 95%. I still cannot stand for the cold air to blow on me, but hey, I am so delighted to feel this relief that I am overjoyed. I would tell anyone with nagging pain to give it a try because for me, it works. I have also experienced better sleep and as I stated, this is only 1 week and 1 day. I am thankful to God that this has helped me. I have already cut my sleep meds in half and expect to soon be completely free of them. This product is good for so many things and has no side effects and is completely 100% pure and safe. It has a 60-day money back guarantee which is one of the reasons I tried it. I am taking CBD now for 2 1/2 month and wanted to share what I’ve been experiencing. I have Lipedema, and digestive issues. I do not get the nutrients out of my diet and have been binge eating, suffered from high anxiety and insomnia. Thus my knee joints and fingers were constantly inflamed and hurting. The first thing I felt 20 minutes after taking my first CBD was the immediate… pain relief in my knees. I also slept wonderful. I was intrigued! My sleep quality improved, I started to have more energy and slowly but surely my anxiety went away. In week 3 I stopped binging. I felt so nourished from the CBD and decided I wanted to improve my way of eating. So far I lost 10 pounds! As you can see the edema in my legs decreased and I’ve been seeing improvements in my skin, hair and nails as well. My digestion is getting better and better! I am absolutely fascinated what CBD does and want to bring it to as many people as possible! They deserve to have their own success story! Thank you CTFO for making this wonderful gift for us! My German Shepherd is almost 10. He jumped out a window twice after a squirrel with a 10 ft. Drop and damaged his hips. For 2 yrs he has hopped with his back legs together. I put a couple drops of CBD oil on his food and I’m absolutely amazed at his ability to run and use his legs!!! My Mom has suffered for many, many years with both types of Arthritis in her hands. Always in burning, throbbing pain, loss of grip and emotional fustration as she was not able to do the things she was used to doing. She has spent endless hours awake at night and way to much money on over the counter creams, sprays and oral medications. After 1 day of using CTFO Ultimate Deep Healing Cream with Emu Oil, she is smiling, no fustration, no burning or throbbing in her hands, she has regained grip ( back to knitting she goes) and she has CTFO to Thank. She has found the Gold at the end of her Rainbow, Ultimate Deep Healing Cream with Emu Oil and CTFO. Until I started taking CTFO CBD oil, I was diagnosed with high blood pressure. After a month of using the oil, I had another Dr app’t and was told my BP was now low. I had all the symptoms of low blood pressure including light headedness and being lethargic. After not taking my prescription for BP, and only using CBD oil, I feel 100% better. Another Dr app’t in the next week will tell the tale . Back in April I started a journey with CBD oil. I was feeling very down, lots of lowered sense of well-being, bulging disc with numbness, tingling, and shooting pain—usually centered in the areas of the buttocks and lower hips, pain in my hip, down the back of my leg. Feeling hopeless about life in general..…. While playing a video game, I received a call from a dear cousin who was taking CBD, with a free business opportunity. I had heard about CBD here and there and that it was good for sense of well-being, but never gave it a second thought for I was very cloudy about the whole marijuana thing because of #1 I’m in recovery and #2 when I smoked back in the day it increased my lowered sense of well-being 10 fold. My cousin explained that CBD had no psychoactive symptoms and he was getting great results with his lowered sense of well-being, it had diminished substantially. First off, I was ANTI multi-level marketing, I didn’t want to be that guy. The business was free to join so I said what the heck, and I could try CBD. Once I got my first bottle, within about 9 days my sense of well-being was better, my all around mood went from eh! to Yes!! I also was very surprised about my numbness, tingling, and shooting pain—usually centered in the areas of the buttocks and lower hips pain, it was gone, I felt no pain from it. Since then, it’s gotten even better, even better sense of well-being, sleeping great, and I have a sleep disorder, and It’s also helping me lose the weight I have gained. And yes no pain from numbness, tingling, and shooting pain—usually centered in the areas of the buttocks and lower hips. The crazy thing is I have a team of distributors helping make me create another income stream, that could lead to early retirement. I want to thank my cousin for reaching out to me that day. I love you cuz! I worked as an assembly line worker for 4 years in a manufacturing company building engines. August 2015 I injured my back lifting a heavy part, while on the line. I could barely walk in the plant, and it seem like every day it got worse. I had to go to therapy and couldn’t really take pain medication for my back injury because of GI bleeds. I couldn’t handle my job and was terminated December 2017. I remember praying to God to heal me because I was hopeless at that point. No Job , No Cure. February 2018, I discovered this little miracle in a bottle. I honestly can say my prayers has been answered & today I’m BACK PAIN FREE. My CTFO Team is growing, and it feels good to be able to do what I love again. I thank God everyday for Changing The Future Outcome! I have had Sarcoidosis of the lungs since my mid 20’s. This is an autoimmune disease, and with this disease and the drugs my nerve system is bad. I have tried everything for the pain. With this Neuropathy, my feet were numb but I also had terrible pain, felt like fire and stabbing. My wife found CBD on line she is always trying to find something to lesson my pain. I have been taking CBD for a while now and am glad to announce that the numbness is mos…tly gone and the pain is to a much more tolerable level. My hope is continuing to take CBD will only make it better. I have the rotator cuff pain – 2 surgeries then a 3rd to try and fix what was done wrong, and now the shoulder is nearly destroyed. Just this past March, I found myself taking an unexpected leave of absence from work, my family, and my home, while I stayed in the hospital trying to figure out why I was so bloated and in so much excruciating pain?! It honestly felt the same as when I was in labour, (other than the pain was centralized, and not in my lower abdomen) as the pain kept coming in waves, and with each passing wave, the pain got worse! After a week long stay, and a colonoscopy, I found out doctors were leaning very heavily toward either Crohn’s disease or Colitis (Tuesday, April 17th was my follow-up appointment, I have posted my update at the bottom of this post). I had been researching CBD oils and their benefits beforehand for mental health issues I suffer from (I will talk about those later), but this incident definitely made my mind up about giving it a try. I found a VERY informative woman who was selling for CTFO, and after talking with her a bit about it, I not only purchased my first product, but I also signed up to become a distributor at the same time. I found after the CAD exchange rate, the product was a bit pricey, BUT considering I had just spent over $200 on only a one month prescription of steroids and anti-inflammatory pills to manage my newfound health condition, spending HALF that for a month supply of an all natural remedy that could handle not only my G.I issues, but a multitude of my other problems, was simply a no-brainer!! For the past 17 years, I have suffered from, and woken up with, lower back pain every day. I often thought to myself, “If I ever woke up and didn’t feel pain, I would probably think I had died!” Well that day came. I started my first day of 500mg oils on April 4th, I took about a 1/4 of a dropper as soon as I got it from the post office, and another 1/4 dropper right before bed. The next morning when I woke up, I was pain free! NOTHING!! Not even a little sore. It didn’t quite dawn on me at first either…I went about my morning; getting the kids up for school, making their lunches, getting myself ready for work, took my pills and another 1/4 dropper full, and made the daily drive to the next town over to carry on with my work day. It wasn’t until later that night when my bf asked me if I’m even noticing a difference yet. Suddenly the lightbulb went off above my head. “Actually…it is!” Then I told him how I just noticed I hadn’t felt any of my usual lower back pain, all day!! After that, I started trying to pay more attention to whether it was helping me in other aspects as well. I also suffer from OCD, PTSD, high anxiety, mild depression, short term memory loss, and adult onset acne caused by stress mixed with overactive oil glands. My mental health issues are slowly becoming less and less apparent. I haven’t been experiencing any moments of depression, and my anxiety levels have significantly decreased! This, in turn, has made it so my PTSD is almost completely at bay. My OCD is no longer ruling my every day as bad as it used to, and I find I’m able to focus more which is also helping me with my memory loss. I even noticed I’m sleeping better and feeling more rested and refreshed in the mornings. I also noticed my acne was starting to clear up…this made me want to try out the facial cleanser to really boost my chances at clearing up once and for all! With such fantastic results so early on after only just starting these products, I gotta say, I am in LOVE with these CTFO products! My 11 year old son was having stomach pains one night before bed, and was having trouble getting to sleep. I gave him 3 drops of my 500mg oils, and within 20 minutes his pain was gone and he was out like a light! Seriously can’t get enough of this stuff!! I am considering giving him a couple drops a day to see if it will help him with his constant fidgeting and mental focus issues…I will post an update if I do, and let everyone know what the results are/were. Had my 4 week follow-up appointment. They still are not 100% sure yet, but as of today, I’ve been diagnosed with Crohn’s disease and will be treated as such, unless other symptoms surface to give way any reason of a doubt. When asked if I was taking anything other than what I was prescribed in-hospital, I told my nurse I’ve been taking CBD oil drops and explained how it’s been helping, not only with maintenance of my IBD, but also with managing my flare-ups as well as other health conditions/mental health issues, she advised me to stay on it (I call that a WIN for CBD!!) as well as continuing to bring down my steroid intake until all finished, and I’ve been advised to start taking my anti-inflammatory pills too for the next month, just for added health precautions. Next follow-up appointment is in 3 months. Unless I hear anything back beforehand, I’ll post another update then! I had the opportunity to use the Deep Healing Pain Cream after a crushing injury to my left ring finger — what a relief!!! The throbbing pain decreased within an hour and within 24 hours, the swelling decreased. As someone who is unable to take narcotics/opioids, this pain cream made a huge difference to me! Had to leave my pet for a while today and was a little nervous because of this horrible storm. She is severely thunderstorm phobic. As we pulled in to the neighborhood just now, a huge lightning strike and loud thunder made me think she may be in a major panic when walking in the door…and all that worry was for nothing! Dosed her with CTFO CBD Oil before leaving the house and although I KNEW she has had great results in the past, I was still concerned. Well here she is, fast asleep…and the storm rages on! Grateful for this product!! My knee pain is virtually gone. I’ve been using the CTFO oil for about a month. 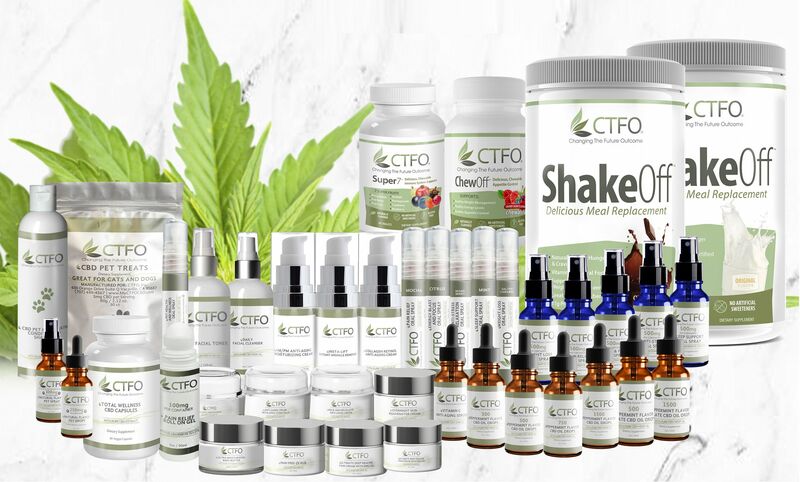 The CTFO brand seems to have more efficacy than the previous brand(s) of CBD oil I have used. Following the suggested servings of 20 drops sublingually 2x per day has virtually eliminated my knee pain.I worked on my knees as a floor layer installing carpet, tile and linoleum for years. I was prescribed opiates for the pain for several years but really didn’t like the side effects. To sum up I will be ordering more CTFO products including the pet line for my chocolate Lab who is starting to have some joint pain. My go to when it’s overwhelming off the chart pain. Today was a day of celebrating for us but also came with paybacks from my body. You see I have one of those invisible conditions that you have pain all over all the time. But it decided it would throw me exorbitant amounts of pain this evening.My old norm would have been adding extra doses of pain meds (because I lived on pain meds), nope not this time! Besides my daily 2 -4 doses of 750 CBD oil I added the Pain Relief Oral Spray, which works amazingly fast and one of my favorites the Ultimate Deep Healing Cream. Yep it worked and not only worked but way faster than and drugs would have! These products are life savers! Here’s My testimony of CTFO SLEEP support spray and CBD OIL!! In my 1st order I ordered sleep support spray and 750 oil.Before CTFO I took sleep aid or unisome and would drink a glass of wine to help me sleep and with all of that I would still wake up several times. Why so many bottles of Unisom in my pic, because when they were on sale I would buy them up!!! I was taking 2 sleep gels a night not the recommended dosage of one and with a glass of wine!! Now CBD OIL and SLEEP support spray is all I take and I’m sleeping through the night!! Now if I have a glass of wine it’s to enjoy not to Aid in my sleep! I am also now 4 weeks FREE of RLS and leg cramps!! this is and update on me and my back. A little history for you all – had back surgery in 1998 many yrs back. well as anyone knows sometimes the surgery don’t work and u still have to be careful etc and deal with the pain when it decides to act up. well yesterday my husband and I worked in our back yard for 4.5 hours, hauling off wet leaves in a trailer- alot of bending over and twisting etc, then we hauled 40 concrete blocks from the front to the back, again bending… over and twisting, then we tore down a huge sand box 6’x5′ and moved all that sand etc, the same thing, twisting and bending over etc.. more than I normally would be doing. Anyway, I normally would be out and in bed for at least 3 days because my back would be in horrible pain from all the work yesterday. and I told my husband, be ready u know how my back is.. we bought laughed and went about our day. so come that evening, we were in town shopping and I told him, we needed to go home because I can feel my back starting to cramp up. so we left and as soon as we got home I applied the Ultimate healing pain cream over my lower back area, and both arms and my right leg which was starting to have that burning feeling.. I AM IN TOTAL SHOCK THIS MORNING..
NO PAIN at all. I was able to get out of bed like normal and we even did errands this morning and no pain.. I am SOLD on these products.. I was watching NFL football on my couch one evening when I started noticing some “pins and needles” on my left side. As the night went on, that feeling became a real numbness all the way down my leg to my foot. As an athlete who regularly ran all over the place, I was confident this was just going to pass. I’ll sleep it off and go for a run in the morning. So, as I woke the next morning, I noticed it was still there. I put on my running shoes-opened the door, and realized I couldn’t get my legs to function properly. Very confused and a bit deflated, I got in my car and drove to my local doctor. Now, I knew things were getting serious. We had a discussion about my knowledge of MS and if anyone in my bloodline ever had it. No one on any side of my family has ever had the auto-immune disease. This would normally be a plus, however, in my case I was diagnosed with Multiple Sclerosis the following day. Deep breath. The following week, my parents came down from New York to my South Carolina residence. It was crazy. I started to get hit with crazy symptoms. Heavy fatigue, loss of balance, loss of bladder control, double vision. It was heavy and hairy. Scary for me as I had just turned 34 years old. I was a major runner throughout my life. Up to that point, life had been an amazing journey. Now, I needed to make some serious lifestyle adjustments to deal with this. it has a lot of healing properties. Most importantly, CBD has been life-changing. It’s had a major impact on suppressing my MS completely. Fast forward to present day- the numbness has fully subsided in my hands and my balance is close to being normal again. 5 different disease-modifying therapies from daily pill form to daily injections, I’m proud to say –“those days are over.” It’s been a combination of the pharmaceutical world, diet, exercise, and relaxation techniques – and most definitely the effects of CBD – to which I can now say, my MS is happily asleep. I’m so fortunate to sit here at 40 years old and because of my experience I’m now ready to turn my attention to helping others. The amazing healing properties of CTFO CBD can help others, not only with MS, but numerous other ailments. I love reading these testimonials and learning about the vast array of illness that CTFO CBD can help combat. From people quitting smoking, to Cancer diagnosis, these products really are life changing. Its an amazing time to be alive. MY husband came home from work with a severe throbbing and pulsing pain in his head and was having problems seeing clearly, normally he takes meds and it wipes him out totally. He came home, so he had 5 drops, then 3, then 5 and another 5. (He did it gradually as he had never taken it before). Total of 18 drops and it worked. He would normally have to write the rest if the day off, but was just left with a slight headache. He was up and functioning afterwards. He was very impressed with results. This was 500mg isolate oil. So a little bit about my background: I have struggled with anxiety and depression since I was a child. I worked hard because I had 2 kids and the bills weren’t going to pay themselves. I was a police officer, bounty hunter and even worked on the ambulance. I bent over one day in 2002 and went numb from the waist down. I was paralyzed for 7 months until I was lucky enough to have a 360-radical fusion from L4 to S2. 2 rods, 6 screws and a plate in my spine. BUT HEY I could feel my legs again and even walked the same evening. So pain was assurance that I had feeling. I’ve since worked in the medical field and eventually went to Michelin where I was a tire builder. Up until this point in my life I thought pain was a good thing because at least I could feel it. Well that unfortunately in 2013 is where my decline started. I was never released & landed in pain management. Unfortunately I was never released to go back to work. Just to function I lived on loads of medications. Percocet, Muscle Relaxers, Anxiety and Depression, Neurontin, Sulfasalazine, Cymbalta and the list goes on. I was sent from one Dr. to another and another, this specialist that specialist for tests, scans, MRI’s they even diagnosed me with MS at one point. I felt hopeless and honestly like a lab rat. The Doctors were all getting paid to not know, diagnose more tests, meds, etc. I ended up having another fusion on my spine but this time C2-C6. Gained another plate and 8 screws. Now you would think that I am the bionic woman because I set the alarms off going into the stores. The cervixal fusion worked for my arms but didn’t help my walking, bending etc. So I’m really hopeless now. Again, unable to work and in constant agonizing pain. Man, I wish I would have found CTFO a long time ago because I could have saved myself a lot of wear and tear on my body and soul. PLUS having to live on narcotics just to cope. I wasn’t able to do anything that I loved anymore. I couldn’t ride my Harley, play with my grandbabies, take my grandbabies on vacations, heck I couldn’t even go on vacations. I’m not going to lie there was times I prayed for God to just take me. TRUST ME there was very little quality in my life at this point and I’m tired. My world was not a happy place. It was dark, hopeless and painful mentally and physically. FINALLY, I was on FB and saw someones post about CBD oil saying all the things it supposedly helped. I laughed because I was in law enforcement and Marijuana is not legal in OK. Kept thinking about it and a few days later after researching I decided heck what’s left to lose at this point so okay I’ll try it. I never expected it to help me AND making it very clear there is absolutely no way am I selling It. Heck I have sent people to prison for that. WELL LET ME TELL YOU my life and my opinion of CBD oil has changed. I joined the company and ordered the 500 mg. It helped me a lot as far as anxiety and depression, but it really wasn’t giving me the relief I had hoped for but I read that for extreme pain you at least needed 750mg. Fingers crossed hoping for a miracle I ordered the 1500 mg. I still set off the alarms at some stores BUT WOW I’m able to do my own shopping and can drive myself around. Let me just say that I would have never dreamed I would ever get any quality of life back much less be able to rid several medications. I’m never going to be without it again because CTFO has given me hope, brighter days, SMILES that I didn’t have for a long time. I’m proud to say that I no longer need ANY pain meds, muscle relaxers, anti-inflammatories, anxiety, or depression pills and I just feel that I need to share this awesome success story with everyone. CTFO has definitely done just that CHANGED MY FUTURE OUTCOME! And let me say I am a firm believer in this company and I would stand up and shout it to the world. CTFO saved my life and brought back my Happy! I’ve had problems with shoulder injury or inflammation of a bursa around the shoulder joint off and on for several years. I have shoulder pain that aches all down my arm and ends with tingling in my hand. I tried all OTC pain relievers (aspirin, Tylenol, Aleve, ibuprofen), prescription painkillers (Lortab, steroids), athletic taping…….Most didn’t help at all. The taping and steroids both helped a little, but the pain returned full force when I stopped… them. On a whim, I tried 300 mg CBD oil…..just once daily. Within 2 days, all pain/tingling was gone!! I thought I must be imagining it, but it’s been several months and still no reoccurrence. I am now a true believer in CBD and it’s healing/restorative powers. My grandparents used to grow hemp, and I’m so happy it’s coming back into favor for so many uses. Electricity went thru his leg and out his eye. He is in excruciating pain and spends most of his days rocking back and forth in severe pain. He decided to try the 1500 mg as of last night. I spoke with him today on the phone and he said the spasms in his body are ceasing and he is elated in the cbd oil now. He was out of options and to his surprise he’s getting relief he hasn’t had in years!! Unbelievable!!! January 2018 had blood work done for new insurance physical. Thyroid labs came back as Hyper (don’t know medical name). My numbers were high, I think like 1200. Fast forward to May 2018, updated labs. Thyroid numbers are normal in the 200s.I credit God first and Him creating Hemp plants, then CTFO bringing this awesome oil to us. I started out with the 300mg and upgraded to the 500mg in April. Thank you CTFO for introducing the greatest products and business opportunity I have ever seen or been in. CTFO products are making a difference in my life. Can’t wait to start on the weight loss products. This is a second testimonial for my husband. In the last few months his kidney function results have been low, he’s been taking anti inflammation medications for chronic pain (not anymore he uses our oil). We see a nephrologist next week. On a whim I asked him to have his levels tested again before we go, since he has been on the oil now for about a month. Results from yesterday’s lab draw… His numbers went from 30 to 48!!! You can’t make this up! The oil works and proven with lab results! We will still see the doctor next week, but we are both very excited and much more hopeful. He’s using the 1500 mgs for pain and now it’s also helping his kidney’s. My husband has had Crohns for almost 20 years. He has been getting remicade infusions every 6 weeks for a few years now trying to keep it in remission. For the last year, the remicade seemed to be working less and less. He was tested for remicade levels and immunity. The last 6 months have been awful. Constantly totally exhausted and in a lot of pain. Our daughter introduced us to CTFO CBD oil. My husband has been taking the 750 at 20 drops a day for less than 2 weeks. The change is unbelievable. He is no longer fighting to stay up past 7pm. He has way more energy. And almost no pain! He says he didn’t realize just how sick he felt until he started feeling better. He just started on the 1500 drops yesterday. We are hoping things get even better. I am totally blown away at how amazing this stuff is. I finally have my husband back. Life for him is good again. I suffer from being Anemic and feeling super tired and my whole body aching daily. I take iron pills but the pain would still remain. Plus I’m heavy set and have knee and ankle issues. Not mention I had Anxiety so bad and mood swings. Since I have been using CBD I have No Pain, No Inflammation, No Anxiety, No Stress plus it helps my Mood and suppresses my appetite!! I’m beyond Excited… to be a part of something that seriously is Life Changing..
Tonight, my daughter who is 13 had leg cramps from growing pains. I sold all my other creams and only had the Pain Free-ze Rub. I thought “well, hopefully this works”… ! Put a little all over her legs and told her to lay still. It wasn’t 10 minutes later she looked at me and smiled saying “That stuff really works Mom!! My pain is gone! !” Thank you CTFO for all the wonderful products that help our bodies!!! For the first time in the 25 years since I returned from serving in the Gulf War, there are times in my days now in which I am totally pain free. I almost don’t know how to act, because I have always hurt continuously. I don’t care about making a lot of money selling CBD oil, but the idea of sharing my story and helping many other chronic pain sufferers including disabled veterans like myself excites me! I am a RA patient and I have arthritic hips and spinal stenosis and disc herniation in my L3,L4,L5. Pain And numbness radiates from my right hip down to my toes. It’s worse in the mornings and if I sit over 15 -20 min or even stand or walk or laying down over 15- 20 mins. So I’m constantly up and down moving around for relief. My knuckles are Soo stiff in the mornings and they aches really bad. Great news! Sin…ce trying the CBD oil deep healing cream I’ve was able to get out of bed this morning with minimal stiffness and I slept really good. I had hardly any stiffness in my fingers this morning. I rose feeling better than I had in a long time since using CTFO deep healing pain cream. Barely any stiffness in my hips or fingers and low back pain was also diminished a lot. Thank you CTFO! This is amazing. Everyone that knows me know I’ve been on organics to lose and maintain weight and also pain control. I have 2 curved lumbar 5 herniated disc with sciatic nerves. I had laminectomy surgery in 2014 I also have a strained rotator cuff and arthritis. I’m usually in pain and lethargic. I’m supposed to use prescription drugs for pain. I can honestly say since using CBD oil I’m not in pain period if I use the oil 2xs a day. I feel twinges the next day s…o that’s my reminder to take my oil drops. I also have an energy boost that’s indescribable and as far as rest every night it’s like I’m in Euphoria. It’s a blessing too. Last but not least. I’m not on any psyche meds right now for depression schizophrenia or PTSD that I used to take. My attitude and personality has been even keel. This company is a blessing with these products. That’s just the oil. I’ll be getting everything we offer because they all work beyond better than amazing. I share because I care. I love the opportunity and I love people and helping others. CBD Products will help Change Your Future Outcome in HEALTH. I feel so blessed that something has finally worked. I have had thyroid issues since I was 20, and all the things that go with that, I have arthritis that has been progressing for the last 5 years.. I have had migraines since I was 20 and there has only been one prescription that’s worked and it’s outrageously expensive.I have tried everything to just make it through the day. When you have chronic pain, you’ll try anything to make it go away. I have only been on the 750 mg drops for about 10 days now and I have so much less joint pains, it literally takes away my headaches in 20 minutes, and I have my energy back. Folks, this is huge. CTFO CBD oil drops are less expensive than just my over the counter pain killers per month. I am finally living the Baby Boomers dream. Dog Treats worked great! Whenever we travel, our dogs become very anxious. I gave the CBD dog treats to our dogs and they were calm and relaxed for several hours. I just wanted to reach out and let you know the CBD has saved me from an opioid addiction. If you know anyone who is suffering, CBD is key to healing! I am now taking 1500 mg and I am actually pain-free. I started the 1500 mg yesterday when the package came in the mail. I was in toothache pain with a chip off below the gumline, unable to eat much. I have also been having rotating mini-lupus flares while I’m titrating off of prednisone. Yesterday it was in my mouth because of the toothache causing extra inflammation, and in my right foot because I’ve been walking a lot. I ate breakfast and brushed my teeth and swished a little 1500 mg around the offending tooth and let it sit in my mouth for a few minutes then swallowed it. My pain level at most today has been a slight 2. Usually it goes from at least 2-6. I took 3 – 1/4 droppers today. CBD is a bone stimulator and anti-bacterial as well as an analgesic anodyne, so it is a natural remedy for toothache. I have suffered with Cervical Neck pain since I was 13 I am now 33, I was in a few accidents that caused my cervical neck to curve the wrong direction because of prolonged muscle spasms and tightness. I have frequented the chiropractor for years which has been a blessing. About 1 year ago I started using acupuncture in conjunction with chiropractor again a godsend. I continue to go for regular adjustments and keep good spinal health. Alth…ough the pain has lessened and not as frequent I still continue to have problems with my neck, and sometimes wake up in the morning with no cervical motion, this is painful and many times if I am not able to get into see the chiropractor I am miserable for days. So this past week-I’ve been on CBD oil for 2 weeks. I woke up one morning with the intense pain in my neck/shoulder, headache and unable to turn my neck. I still continued to take my CBD oil. My usual go to when this happens in ice, heat, muscle relaxants and ibuprofen. I increased my CBD dose and within 1-day I am symptom free. This is unheard of, as I usually suffer for days until I am able to get in to see my amazing chiropractor. I am a believer and know that we can impact so many other peoples lives with simple solutions. For some reason, I have had horrible reactions to mosquitos this year. Not to mention the mosquito population doubles the population of China! I was on my patio the other evening and got bit. I thought of my CBD oil and all the research I have done, so I applied a drop to the bite and rubbed it in. Guess what? It’s gone! So here is my testimonial so far. Let me tell you, I feel fantastic this morning. This is with meds. This issue had caused me headaches(10 on a 1-10 scale for pain) , insomnia and anxiety about sleeping. This morning I checked my blood pressure………….124/82. It has not been in this range for a long time. I …feel calmer, not as stressed and have been sleeping great. Usually when I wake of a morning, I seriously feel like death, not the last few days. I’m so happy that I decided to bite the bullet and try this. Even though sometimes we don’t have the extra money, this will be a top priority for me from now on. I’ve even had one of my customers comment on how happy I was today compared to normal. I hope you guys will try it soon, I just know you will not be disappointed. Ooh and btw, my severe knee pain that I used to grin and bear, now is barely noticeable. What a win for me. I started with one bottle of CBD 500 my second bottle of CBD 1500 I am currently using. My sugars are dropping to normal levels 3 weeks ago I felt my depression was totally gone but I am feeling better every single day I am taking one serving of CBD 1500 per day and have never felt better all I can say is thank you I love my pain free life. Hello Everyone… Well I guess it’s time for a Testimonial, I’ve been taking my drops now for two solid weeks and as a diabetic I was hoping to see a slight improvement in my blood sugar numbers. Now, I haven’t changed my diet or anything else radical in my life. Also, lets not leave out the overall benefit of just feeling better. I’m looking forward to seeing my doctor in the near future to discuss a reduction of my daily meds. So lets keep the faith and march on to bring wellness to the world!!! If you know me, you would know that I was hit with extreme pain in my back and down my right leg caused my Sciatic Nerve 2 years ago. What happened was I went to Florida with my family & the very next morning my back was hurting me and by 6 pm, my son had to take me to emergency. I was crying, mouning, shaking, sweating & my heart was beating really fast. I felt like getting sick & passing out. I don’t wish that kind of pain on anyone. They gave me a shot for pain & sent me home with a bunch of pain meds that didn’t work very well. I was sick and in pain for 3 months. In & out of the emergency a few times. I lived & slept on a walker for those 3 months. Could not drive. My husband took me too Physio, Chiropractors, Messengers, Acupuncture everything I can think of. On the 4th month I went for a Cortisone shot. Yes I had relief but once 3 months was up, I was back in the same condition again & had to get a cortisone shot over and over again. But hey, I still had to be on those horrible pain meds that was killing my stomach & still couldn’t get around like I liked too. I was told that CBD Oil would help me get off of all the Advil I was swallowing every day. stomach & joints? I think not! Cannabidiol Centre for a prescription. They wanted $350.00 per month for CBD Oil!!! It was like what! I couldn’t afford that! So Thank God I found this company, through a friend, that’s way more affordable! PLUS there is a way I can get my products for free & make an income at the same time!!! How amazing is that! I ordered the 500 CBD Oil Drops & I’m down to 2 Advil’s a day. My next order will be the 700 CBD. If I need to go higher, that’s fine as long I can say goodbye to the pain and Advil for good. So looking forward to dumping these Advil’s that are killing my gut, my joints, making me dizzy & tired. Thank You My Friend For Showing Me A Better Life With CTFO & The CBD Oil!!! The Company Is A God Sent To Me. I became an associate in January, and just by showing friends and family how CTFO is helping me, I have over 40 enrollees and new customers almost every day this week! I was with an MLM for years and never had this kind of success this quickly! Keep sharing keep caring! That’s the key! Thank you to my enroller and my team! I do believe this is my ship coming in! I made it from Active Associate to Executive Manager in the last 2 weeks! I’ve used doctor recommended, Chinese herbs and OTC pain creams … But this CBD Deep Healing Pain Cream with Emu Oil took my hip pain away, which has been bothering me for a few months now. I asked my hubs to rub it on for me last night, sitting all day it was hurting. I also had a headache that seemed to be all across my forhead. I put the pain cream on my forehead while he rubbed it into my hip. Within minutes I felt the tension release in my head, I could relax. And my hip, since I was in bed I couldn’t tell if the pain went away last night. But this morning I feel like I never had any hip pain!!! And that’s after only one time use! I’m doing the happy dance. I can’t even believe how amazing these products work!! You don’t have to live in pain or rely on prescription drugs to feel good!!! There’s all natural solutions that work wonders!! Hurry up and get back to the person sharing this testimonial with you! I have been taking my 500cbd oil for awhile now. Awaiting my arrival of auto ship, I am out of my oil as of Friday the 13th. And I have had to result to o.t.c. As of this morning, I slept horribly Saturday night, I am sluggish after 3 cups of coffee, and my mind is so foggy….I am totally sold on this product!!! I cannot return to living on our.t.c. meds, and refuse to!!! Actually, I have saved money from NOT spending on other meds just from being on my …oils.! I could really keep going all day with these CTFO CBD reviews and testimonials. People are so excited about how these amazing products are changing their lives as well as the massive income potential in running a free to start CTFO CBD business. Don’t get left behind, things are just getting heated up in this industry. Strike now and get in on the products or even better the business model. Use the link below to get started!